* This review may contain spoilers for The Parasol Protectorate series. To Sum It Up: Lady Prudence Alessandra Maccon Akeldama is all grown up and sent on a mission to India on behalf of her beloved adoptive father, Lord Akeldama. But what should have been a relatively straightforward task turns into a matter of all sorts of intrigue involving a kidnapping and some supernatural hostilities. Rue may need to call upon her metanatural talents to get to the bottom of things as only the captain of a floating ship painted to resemble a ladybug can. Review: When we last saw young Prudence, daughter of preternatural Alexia and werewolf Conall Maccon as well as adopted daughter of vampire Lord Akeldama, in the final Parasol Protectorate novel, Timeless, she was but a toddler. So too were the Tunstell twins, Primrose and Percival, offspring of Alexia’s dearest friend, Ivy, now queen of the Wimbledon vampire hive. Prudence finds everyone grown up, and here marks the beginning of the adventures of Rue, as she prefers to be called. It must have been quite the challenge for Gail Carriger to not have Rue resemble Alexia too much (or Prim be a carbon copy of Ivy), and Carriger succeeds at portraying both young ladies with distinct personalities of their own. Rue is a little softer around the edges than Alexia, with considerably less bluster and bluntness than her mother. Likewise, Prim is a little more sensible than Ivy. Alexia and Ivy always did make a great best friend duo, and their daughters do as well. Rue and Prim are joined on their journey to India via Rue’s dirigible, The Spotted Custard, by Prim’s twin Percy and Quesnel Lefoux, son of inventor Genevieve Lefoux from both the Parasol Protectorate and Finishing School books. Percy is a brilliant academic who barely takes notice of anything not related to academics. His pedantry is quite humorous. Quesnel shares his mother’s love for gadgetry, and his other pastimes include getting flirty with Rue. Definitely keep an eye out for what develops between these two as the series progresses. Parasol Protectorate readers will not be disappointed by the various appearances of some very familiar faces from that series. They turn up just enough to remind you why you love them, yet they don’t overshadow Rue and her friends. Carriger also does an excellent job of expanding the supernatural aspect of this world, pushing it beyond vampires and werewolves. Rue’s rare metanatural talent, which was introduced in Parasol Protectorate and which allows her to temporarily steal a supernatural being’s abilities, of course features prominently in the novel and further gives the world of Prudence its own personality, distinct from that of its parent series. As thrilled as I was to meet an older Rue and her companions as well as catch up with some beloved characters from Parasol Protectorate, I can’t overlook the rather large issue I had with the book’s pacing. 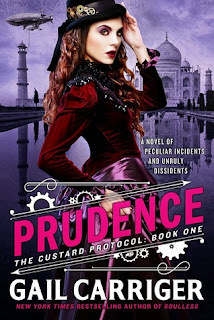 Nothing much of significance happens for about the first third of Prudence, as Rue and her three friends make their way to India. I found myself asking, “Are we there yet?” often because I felt like I was getting nowhere. The lengthy clothing descriptions could have been trimmed in favor of more action to move the story along. It gets there eventually, but that’s the point—eventually. Plus there was just something missing here; the wit that I’ve come to love and expect from Carriger’s novels didn’t seem as sharp in comparison to both the Parasol Protectorate and Finishing School books. Nevertheless, I’m heavily invested in this new generation of characters and what happens to them and will certainly be picking up the sequel. 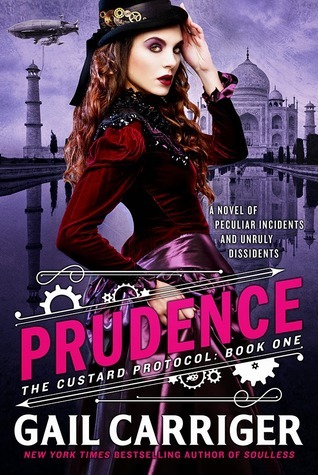 All in All: Prudence was very slow to start for me, although the pacing did improve markedly by the end of the book. It also didn’t quite have the magic of Carriger’s other two series, but I’m very hopeful that the next book will live up to the potential that’s been formed here. I heartily approve of this plan, lol. This was pretty light on plot and action until well into the book, and I couldn't quite get past that. Now that the characters and the tweaks to this world from the previous series have been established, I'm hoping that book 2 will dive straight into the story. Too bad that this fell short in comparison to others that you have read. I own a few Gail Carriger books, but have not read anything by her yet. Maybe this year, as I am reviewing less and cleaning up my shelves more. Thanks for your great review. New follower on Feedly, looking forward to your posts.